Create a audience-friendly P&ID in PPT at ease. Edraw allows users to make P&ID for PPTX on both Mac OS X and Windows system. Check out how to do it in the following guide. It is undeniable that PowerPoint still rule the business world and it also plays an irreplaceable role in education world. But it is quite limited in graphic design. It's difficult to create a P&ID directly in PowerPoint. 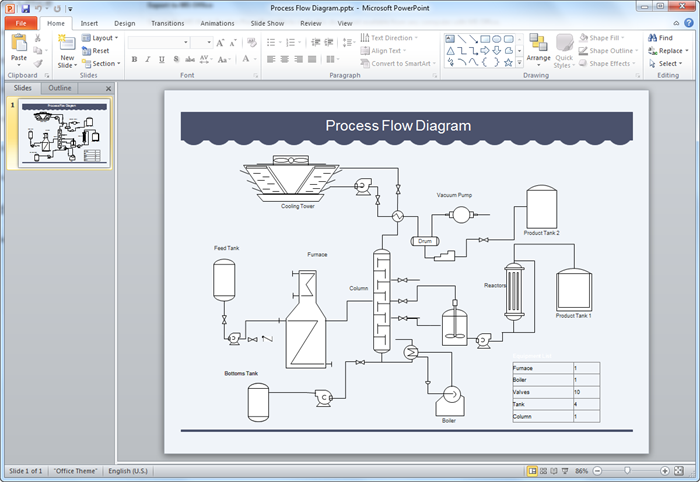 So Edraw offers an easy solution to overcome PowerPoint's limitation. It is a professional P&ID design tool with built-in graphics and symbols. Like the picture shows below, the final result is high level. And no matter what devices you are using, Mac or PC, our cross-platform based software can work well and produce amazing P&IDs. A P&ID is a detailed graphical representation of a process including the hardware and software (e.g., piping, equipment, instrumentation) necessary to design, construct and operate the facility. As defined in the PIC001: Piping and Instrumentation Diagram Documentation Criteria by Process Industry Practice (PIP) – a consortium of process industry owners and engineering construction contractors who serve the industry. Start Edraw, select Industrial Automation and then you can choose to create: Process P&ID, Utility-Generation P&ID, Environment P&ID, Auxiliary System P&ID and Distribution P&ID. Double click one template icon to open a blank drawing page and the relevant symbol libraries. Choose desired shapes; drag and drop them onto the canvas to start drawing. Connect instrument and other facility shapes with pipe shapes. Lay out your P&ID by using grid lines and quick Align and Distribute buttons. To add the final touch quickly, apply a theme that you like. More details about how to create P&ID. 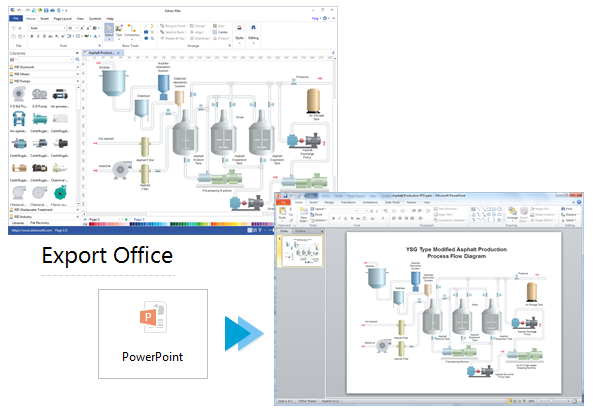 Edraw helps you get started with your P&ID quickly, and export to PPT format instantly with one button click. After you finish your P&ID, export it as PPTX file for easier publication. Simply switch to File tab, click Export button and choose PowerPoint to save your file as PPTX format. The exported P&ID will remain the vector feature in the MS PowerPoint. It can be zoom in and out to any extent while keeping in high resolution. 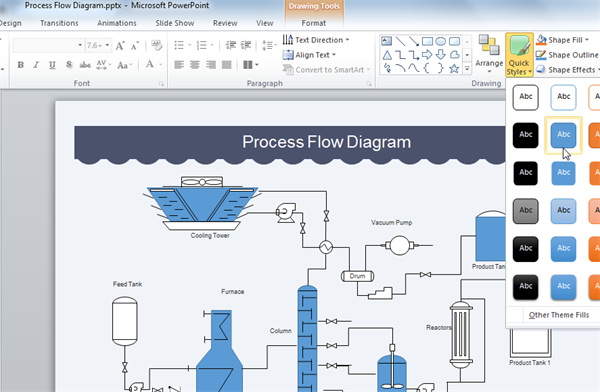 Continue to edit text, recolor shape, and apply quick style in MS PowerPoint. Discover why Edraw is an excellent program to create P&ID. Try P&ID Software FREE.